Today’s Back Issue is actually two separate pieces. 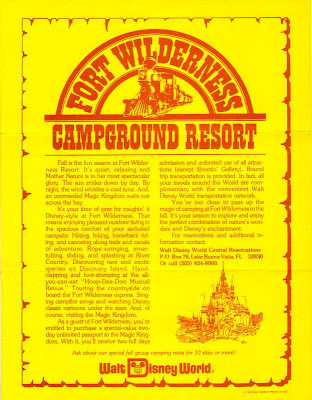 Both are flyers, one from Disneyland’s 1989 Blast to the Past, the other a 1979 advertisement for Disney’s Fort Wilderness Campground Resort. While at first the two items seem to have nothing in common, after reading both it becomes apparent that the both exemplify a classic Disney trait: creating emotional relevance for bygone eras and activities. 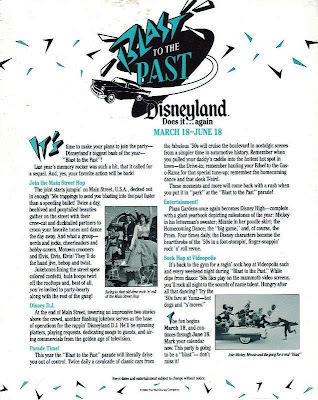 From the Hoop-Dee-Doo Musical Revue to the Sock Hop at Videopolis, these advertisements are full of exciting possibilities from years gone by. To read each in their entirety, simply click on the images. Loved the Ads... especially the Fort Wilderness one. Funny to think how back then WDW was just the northern part of the property. Everything was self contained and in 3 or 4 days you coeld see everything WDW had to offer! !